I wanted to create something that was not apparent up close so I figured the best way to go about it was through pixels. 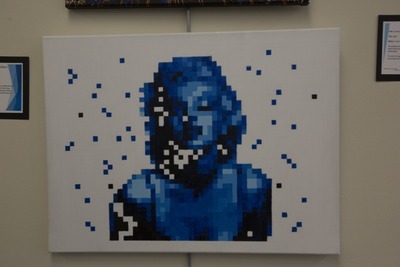 Inspired by the works of Chuck Close, I created Monroe with the use of acrylic against a monochromatic color scheme. This produced a visually appealing piece that reveals itself the further back you observe it. © 2017 Nicholas Cowan, All rights reserved.